Never mind cotton. Forget wool. Skip those high-tech, wicking polyesters. Have I got a fabric for you. Well, I don’t, but researchers from the University of Maryland do. Welcome back. I thought you’d be interested to learn about this new fabric, even if it’s not quite ready for market. In short, the fabric is thermally responsive. It automatically responds to the temperature and humidity of our skin to either release or trap heat. I could stop there, but I’ll continue for those in disbelief or who just want to learn more. Since the fabric’s ability to regulate the heat exchange is tied to infrared radiation, I’ll start there. In a blog post several years ago, I illustrated the use of thermal sensing in medical imaging (Thermal Body Mapping Addendum). Thermal images, where colors correspond to temperature differences, have been used to assess the effects of stress on hands of patients with different medical conditions or injuries (from iopscience.iop.org/0967-3334/33/3/R33/article). As I wrote at the time, thermal imaging should at least be of value where dissipation of heat through the skin is diagnostic. Here’s what that was all about. Photographic cameras collect radiation that we see. Thermal sensors collect radiation in the infrared (IR) region, which is beyond the sensitivity of our eyes. IR radiation covers a broad spectrum of wavelengths. Thermal sensors normally collect IR radiation at longer wavelengths, where the level of radiation is related to the temperature of the object sensed. In general, the hotter the object, the more IR radiation it emits. The principal way our bodies lose (emit) and gain (absorb) heat is through IR radiation, and our skin is a very efficient emitter and absorber of IR radiation. If we’re cold, we add clothes to reduce the transmission of IR radiation; if we’re warm, we remove clothes to promote the transmission of IR radiation. The newly developed fabric does both. For the new fabric, the researchers took fibers of two different synthetic components, one that absorbs water, the other that repels it. They coated the fibers with a thin layer of carbon nanotubes (lightweight, carbon-based, conductive metal). Because the coated fibers both absorb and repel water, the fabric warps when exposed to humidity such as from a sweating body. That distortion opens pores in the fabric, allowing heat to escape. Of greater consequence, the distortion brings the coated fibers closer together. That modifies the electromagnetic coupling between neighboring fibers, changing the way the fabric interacts with IR radiation. Depending on the tuning, the fabric will either allow IR radiation to pass or block it almost instantaneously. 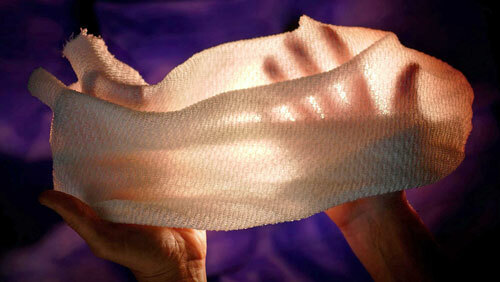 Thermally responsive fabric (photo by Faye Levine from today.umd.edu/articles/hot-and-cold-comfort-a77c4599-3bb4-4efd-83d2-79ac418ad018). The researchers report that the new fabric effectively modulated the IR radiation by over 35% as the relative humidity of the underlying skin changed. They note that, while more work is required before we’ll see clothes of the new fabric, the materials are readily available. The carbon nanotube coating can be added easily during the dyeing process. And yes, the fabric can be knitted, dyed and washed like other sportswear fabrics. So, get ready.